Public transportation in South America thus far has been an adventure: farm animal seatmates, off-roading in a 60 passenger bus, picking up hitchhikers along the road. The bus to La Paz had a water crossing – but not the usual ferry crossing that we were used to. 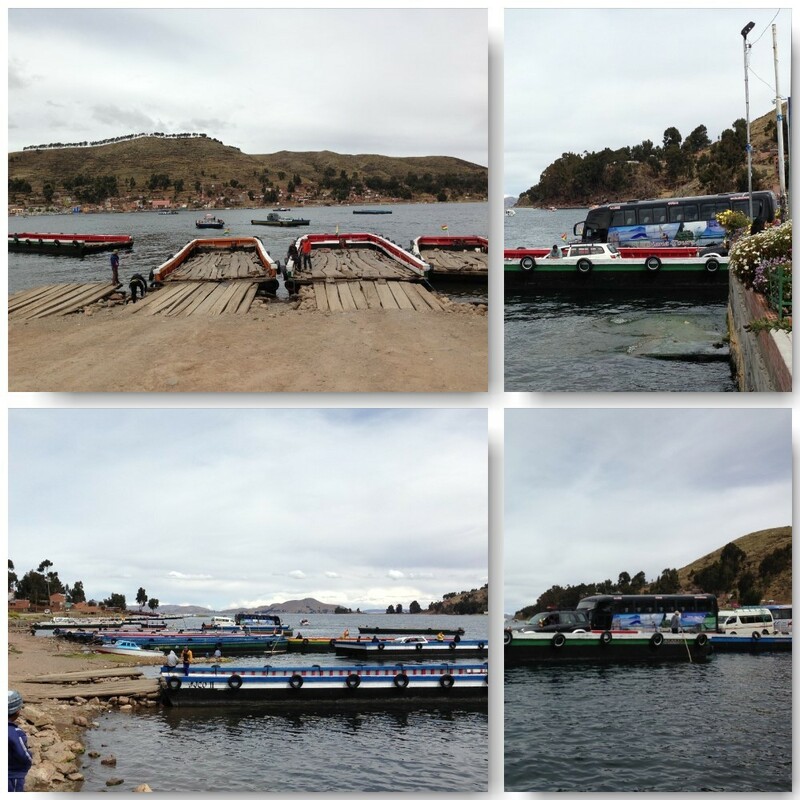 People + the bus would be too heavy for the small wooden boats, so all the passengers filed onto several smaller boats as our boat was shuttled separately across the river. 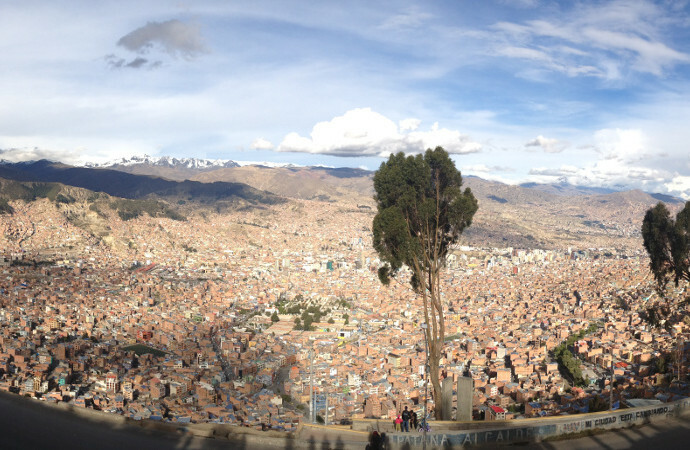 We stayed at a mega-hostel in La Paz – it had over 200 beds! This was our first time staying at one of the more popular “party hostels.” We were each given wristbands with our first name, room number, bed number – it was hard not to feel like a number (Matt prefers inmate). I am mosquito bait, so we decided against going to the jungle. Bolivia would be more focused on city-exploration. 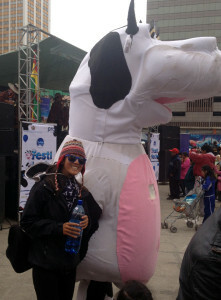 In Colombia/Peru, it was all about finding the pastelerias; in Bolivia, it is all about the chocolate shops. 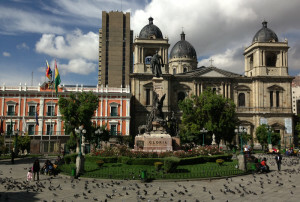 Bolivia is trying to compete in fine chocolate exports. Our favorite was Ceibo organic dark chocolate, but they also make interesting flavors like Uyuni Salt and quinoa. The benefit of staying at a mega-hostel were the activities. Monday before Halloween, they had trivia night! My favorite! 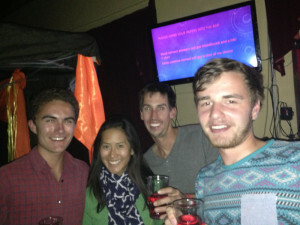 We teamed up with the guys sitting at our table (who turned out to be recent high school grads from the UK – wow, did we feel old). 3 rounds later, to our surprise – we won! Cheers to team Are We Braveheart?! Our prize? Free shots and a t-shirt. Matt was actually pretty excited for the shirt to replace the one he had stolen in Mancora. 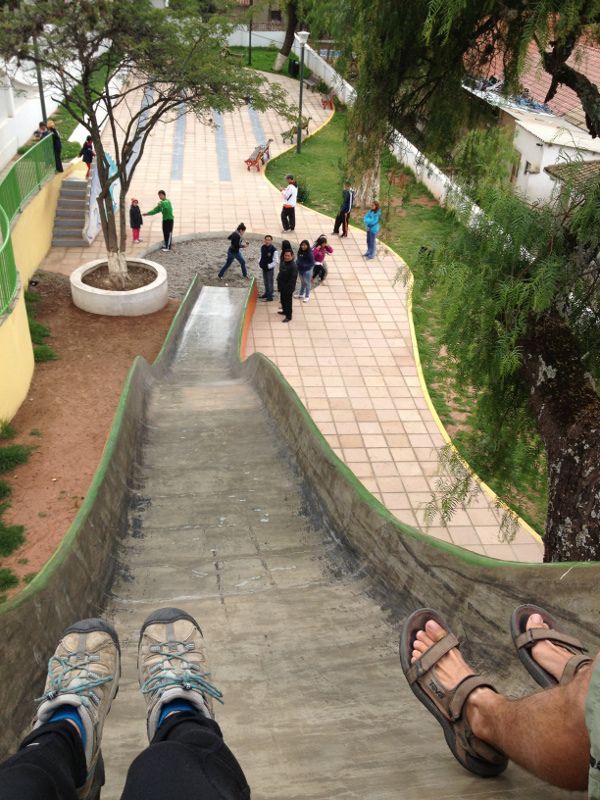 We continued on to Cochabamba. Within 20 minutes of arrival, Matt declared that this was his favorite city. This was BEFORE we discovered the taco truck two blocks from our hostel. Cochabamba has temperate weather and a welcoming plaza. There were lots of restaurants and cute cafes where the locals would hang out. I got to eat fresh vegetables at a vegetarian restaurant – such a treat. Every small luxury is appreciated. 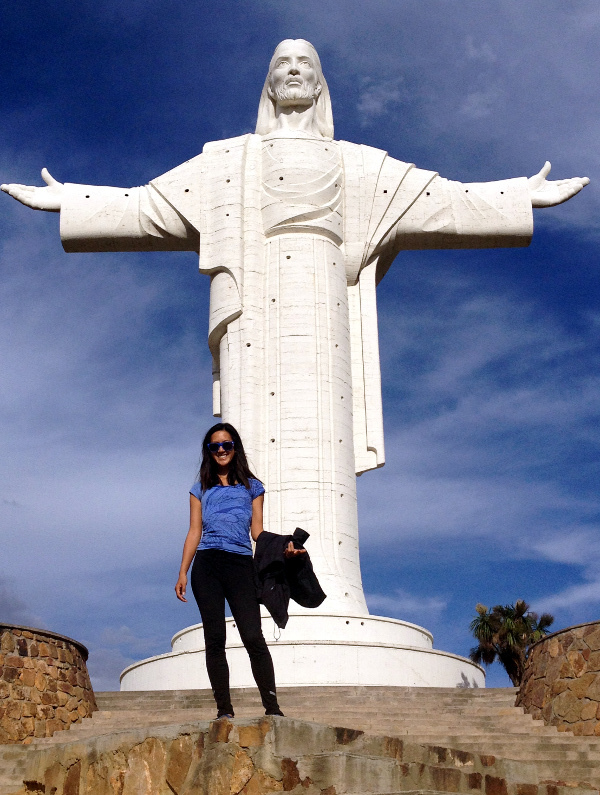 Forget Rio de Janiero’s Christ the Redeemer, we went Christo de la Concordia, the tallest Christ statue in the world (taller than Rio’s by 44 cm). After one extra day in Cochabamba (since all the busses were sold out, after we had walked the mile to the bus station with our bags packed! ), the chocolate tour continued in Sucre. 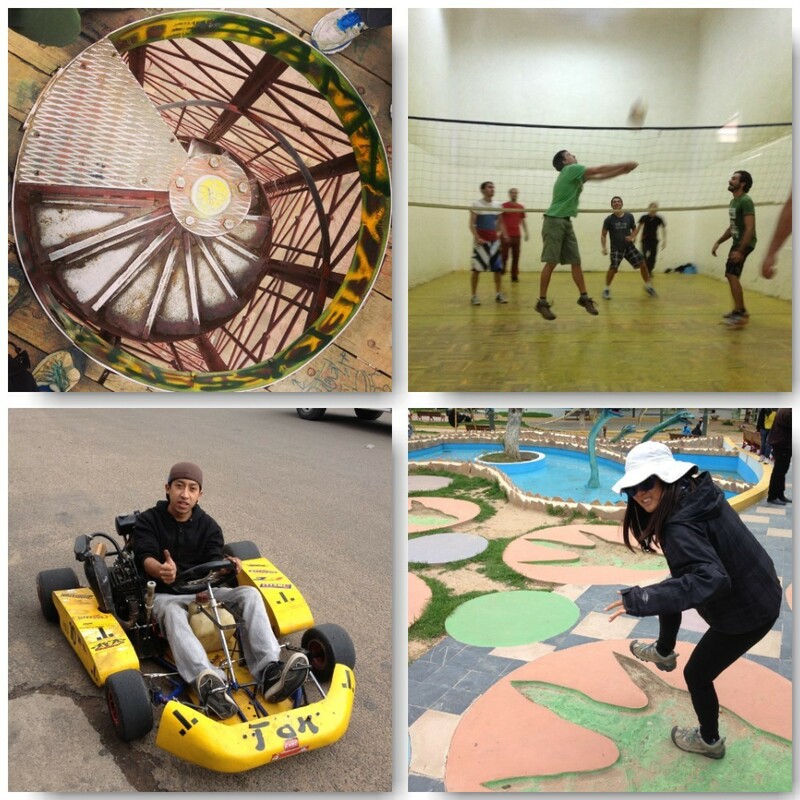 The hostel there, Wasi Masi, was one of our favorites to date. The other travelers were extremely friendly, and it was nice to feel a part of the little community. Many were staying in Sucre for several weeks, mostly for the inexpensive private Spanish lessons. We went to play two hours of Wallyball at a local gym. Think racquetball + volleyball combined into one sport. A few of us went to dinner as a big group which was a nice change of pace. One of the interesting people we met was Taso, a Canadian traveler who started out his journey with a bike ride through the US. The next morning, we went on a walk around the city. Sucre boasts the coolest kiddie park that I have ever seen. If I was a kid, I would want to come every day (Matt agrees). 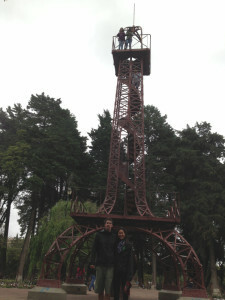 In Bolivar Park, there is a miniature Eiffel Tower that Gustaf Eiffel was contracted to create in 1906. Interesting that they chose Sucre to be the site of the Eiffel Tower’s lil’ bro. This was a much shorter (and free!) climb to the top. During our exploration, we stumbled upon some race karts – apparently there are races every 3rd Sunday. These things were whizzing at 70-90km around the circle, sharing the road with the other cars. Sucre has been one of my favorites – not for anything spectacular that we did, but as a relaxing place to hang out with a sense of community. We could have stayed longer, but we needed to start making moves south. We were excited to get to Uyuni where hoped to re-meet Tash & Nick, friends from La Casona, and Luca, an Italian friend from our travels.